The digital poster of the upcoming Marathi film LaalIshq was released with much fanfare yesterday. The film stars none other than chocolate hero of Marathi cinema Swapnil Joshi in the lead role. Starring opposite him is the pretty Anjana Sukhani who is acting in her first Marathi film. She gave us a glimpse of her newly learnt Marathi at the release yesterday. Posters of Marathi films usually lack any kind of thought behind them. Most of the times the posters just have an assembly of the faces of the characters in the film making the poster just about functional. However, this does not seem to be the case with LaalIshq. There is a certain amount of thought put behind the poster. Not only that, it also has an artistic feel to it with a careful selection of the palette of colors used. 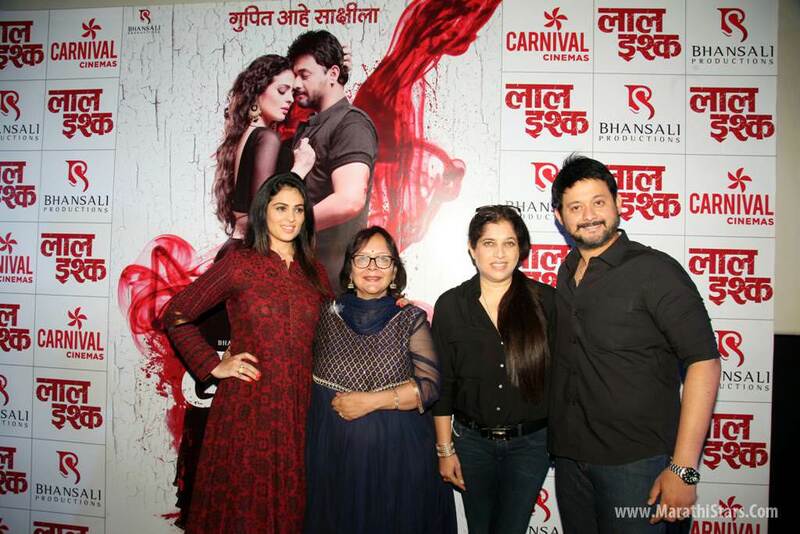 The LaalIshq poster is a combination of Red, Black and White: Red – as it signifies love and also because it is the color of blood. Black – as it signifies lies and there is a fair bit of that in the film. White – but finally truth prevails and so white as it signifies truth. All of this gives us an indication that LaalIshq is not going to be your usual sweet love story, but a one with a rather sinister twist. Sanjay Leela Bhansali who is popular for his grand productions in Hindi has ventured into making a Marathi film for the very first time. The attachment of his name to the project has certainly raised everyone’s expectations from the film. Swapnil has taken efforts for a different look and it is visible from the motion poster. There is a sparkling chemistry between him and Anjana in the poster that is hard to miss. Apart from the two lead actors the poster launch was conducted in the presence of the ensemble cast involving Sneha Chavan, Jaywant Wadkar, Priya Berde, Piyush Ranade, Kamlesh Sawant, Milind Gawali, Samidha Guru, Uday Nene and Farzil Pardiwalla. Also present were the writer of the Shirish Latkar and the director Swapna Waghmare Joshi. The film is co-produced by Shabina Khan. The music is composed by music director Amitraj and NileshMoharir. The movie promises to give a new dimension to romance in the Marathi film industry.